A deep eutectic solvent composed of choline chloride (ChCl) and urea has been recently introduced as a promising cellulose compatible medium that enables e.g. fibre spinning. This paper clarifies the influence of such a solvent system on the structure and chemical composition of the cellulosic pulp fibres. Special emphasis was placed on the probable alterations of the chemical composition due to the dissolution of the fibre components and/or due to the chemical derivatisation taking place during the DES treatment. Possible changes in fibre morphology were studied with atomic force microscopy and scanning electron microscopy. Chemical compositions of pulp fibres were determined from the carbohydrate content, and by analysing the elemental content. Detailed structural characterisation of the fibres was carried out using spectroscopic methods; namely X-Ray Photoelectron Spectroscopy, solid state Nuclear Magnetic Resonance and Raman Spectroscopy. No changes with respect to fibre morphology were revealed and negligible changes in the carbohydrate composition were noted. The most significant change was related to the nitrogen content of the pulp after the DES treatment. Comprehensive examination using spectroscopic methods revealed that the nitrogen originated from strongly bound ChCl residuals that could not be removed with a mild ethanol washing procedure. According to Raman spectroscopic data and methylene blue adsorption tests, the cationic groups of ChCl seems to be attached to the anionic groups of pulp by electrostatic forces. 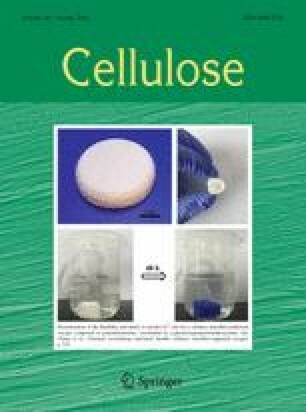 These findings will facilitate the efficient utilisation of DES as a cellulose compatible medium without significantly affecting the native fibre structure. The online version of this article ( https://doi.org/10.1007/s10570-017-1587-0) contains supplementary material, which is available to authorized users. The authors acknowledge the Finnish Funding Agency for Innovation (TEKES) for funding the work via Design Driven Value Chains in the World of Cellulose 2.0 project. The Academy of Finland (Project ID 300367) is acknowledged for enabling the research mobility of T.T. to the University of Exeter, UK. Unto Tapper (VTT) is thanked for the SEM imaging, Atte Mikkelson, Ritva Heinonen and Marita Ikonen (VTT) for the chemical analysis and Robertus Nugroho (Aalto University) for the AFM imaging.